In the year 2015, 66% of marketers agree that social media marketing is core to their business. And, nearly double the number of marketers categorize social as a primary revenue source compared to 2014. With these types of statistics I don’t need to explain any further the importance of social media in today’s digital marketing world. But with the number of businesses on multiple social platforms continuing to increase annually, this also means there is more competition in the social space for your business to attract attention. Following the same social strategy as every other business isn’t going to make you appeal to new followers and engage existing ones. 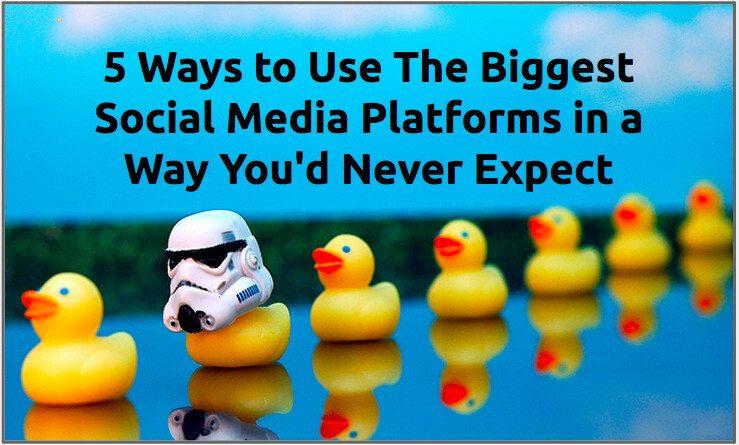 But, as it turns out, there are a number of ways to use the major social media platforms differently than you would ever expect. Want a kickass social strategy that stands out? Keep on reading and find out 5 ways to take your social strategy off the beaten path. A few years ago if you had told the average person that Pinterest was an effective strategy for B2B businesses to gain new leads, they’d have laughed in your face. Last time I checked Pinterest was an 80% female demographic platform for finding ways to turn a wooden pallet into a lawn chair and pinning your favorite haircut, right? 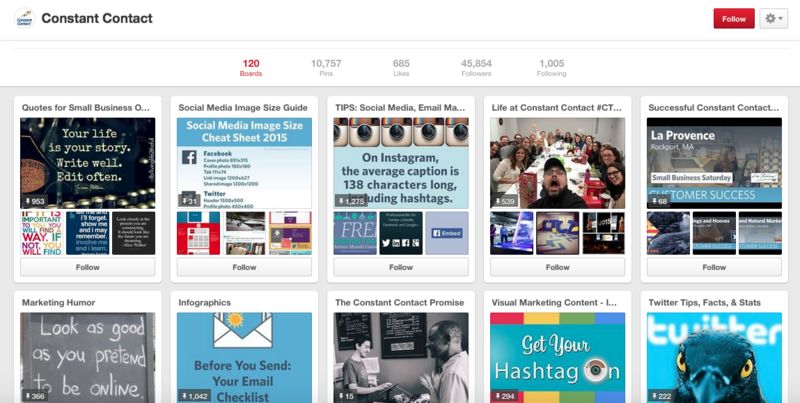 Just as visual platforms like Instagram and Slideshare have gained more ground in the content sharing world, Pinterest has evolved into a useable tool for businesses. B2B businesses ranging from Marketo and Hootsuite to General Electric are jumping on the Pinterest bandwagon as yet another outlet to visually capture the attention of followers. It turns out your business doesn’t need to be visually inclined to create appealing visual content. While it may be easier for ecommerce brands or those in visual industries, there is still plenty of opportunity for B2B brands. Constant Contact, for example, has over 45,800 followers and over 10,700 pins on 120 boards, covering everything from customer spotlight to infographics to email marketing tips and office culture. They’re a perfect example of a B2B business sparking engagement on Pinterest even though email marketing itself doesn’t seem like the most visual industry. Marketing influencers are also using Pinterest to expand their awareness and generate new online traffic and leads. In our article “Influencers Speak out on Their Most Successful Marketing Strategy of 2014” we discovered that Maximize Your Social founder Neal Shaffer had begun dedicating more time and effort to becoming part of the Pinterest community to garner a new type of social traffic. Rebekah Radice is another influencer who is active on Pinterest, giving digital marketing tips in a visual format. Think of existing content you already have such as cool graphics you have used for blog articles, or those beautiful infographics you still have saved to your desktop. Create a board for ebook covers, including the link to the corresponding download landing page in the pin’s description. If you are a B2B business or a self-employed individual think twice before glossing over Pinterest as a social media channel. It can work for any type of business and give you benefits in a way you would never expect. Originally launched as a social network for business professionals, LinkedIn has transformed into an integral component of a business’ marketing strategy. And no, not just B2B businesses. LinkedIn company pages have evolved over the past few years allowing you to have Followers, status updates and even targeted ads for your business. Having a company page allows you to increase exposure of your brand, showcasing your products and services in a new way. 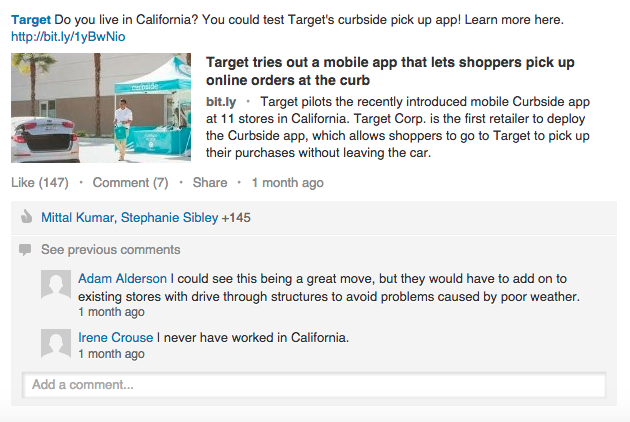 An example can be seen below of Target sharing information about a test launch of a new service. It informs their audience about changes being made and promotes the test launch of curbside pickup. Add videos of product demos or company culture. Use LinkedIn analytics to monitor monthly page views segmented by demographics, allowing you to better tailor your content to the needs of your audience. You can segment based off of things such as their industry, geographic region, and many more. Increase your visibility by posting content in ecommerce groups or those relating to your industry or product area. Create LinkedIn ads to target individuals based on their job, industry, company size and many other elements. Most importantly you need to ensure that you are posting relevant and interesting content to attract your target audience. To most professionals LinkedIn is not somewhere where they would expect to see advertising, which can work to the marketer’s advantage. Ecommerce ads catch users off guard and grabs their attention. A hotly-debated social network, Google+ has been the focus of much controversy over the past few years. Traditionally thought of as a content-sharing network, Google+ has started to serve other purposes. Influencer Mike Allton, for example, told us that he has found great success using Google+ Hangouts. Google+ Hangouts were originally created as a way for multiple people to be involved in a conversation (much like an alternative to a Skype conference call). But now they have transformed into a social marketing tool. Google+ Hangouts On Air allow you to broadcast content publicly on Google+, Youtube and your own website, allowing you to reach large groups of individuals with video conversations. Your business can host interactive conversations or presentations with people all over the world. Many businesses (from the New York Times to the Black Eyed Peas) have created Google+ Hangouts on Air series to discuss topics of interest to their target audience. Instructional or educational tutorials, product demos, question and answer sessions or live webinars - it’s a great tool to socially engage with users and communicate in a new, interactive way. It is also a more fun and personable way to talk to your customers or leads and get to know them on a more human level in real-time. 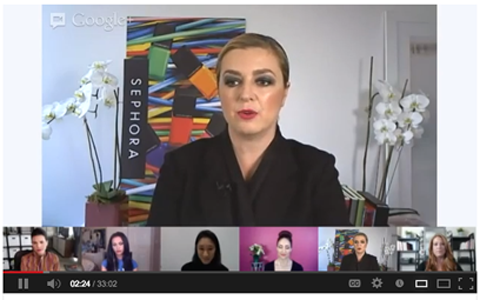 An example of a Google+ Hangout on Air can be seen below from cosmetics brand Sephora. They chose to have a hangout with some beauty bloggers and experts and customers to discuss the latest trends. So whether a beauty brand, a social influencer or a musician, Google+ Hangouts are a great way to communicate with leads and get to know your customers or followers. A Twitter live chat is an online event focused on one general topic. For us as digital marketers that may involve email marketing, SEO, Adwords or Facebook Advertising. But a Twitter chat could revolve around anything from beauty and fashion to cars and music. It involves a single hashtag being used in order to moderate the conversation and ensure everyone is talking in the same place. A Twitter chat is a great way for your business to converse with customers or followers and get them engaging with your brand and the industry it is in. You can gain exposure as a brand and build relationships by communicating in real-time and putting a friendly personality behind your account. No matter what industry your business is in, hosting a Twitter chat is a great idea if you have a strong social following. Brands like Whole Foods (the organic food retailer) and SEM Rush (the SEO tool) obviously have very different business models but both hold chats using the hashtags #WFMdish and #SEMrushchat respectively. If you don’t have the following to hold a chat, simply getting involved in others’ chats is a great way to socially network your brand. If other companies or influencers in your industry hold chats, get involved and get your voice heard by the community. 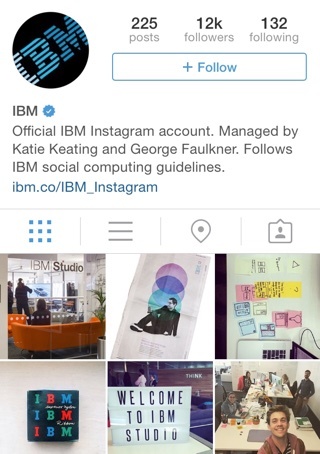 With over 300 million monthly active users, Instagram has become a social platform impossible to ignore. And businesses have caught on to this trend big time. When you consider brands on Instagram your mind likely jumps to brands like Redbull, H&M, Nike, Starbucks, BMW and so. The theme is that these all happen to be B2C retailers. But what about B2B businesses? Just because your business doesn’t fall into the category of adventure, clothing or material goods does not mean it can’t be visually appealing. Instagram allows you to showcase your brand in a visual way whether it be through behind the scenes photos from your office, those announcing company news, or a photo or video outlining a product demo. Aside from being the most recent social media channel to rise to the top, Instagram has often been cited as the most friendly and personal for business. It easily allows you to showcase your employees, run contests for fans and put some personality behind your brand (whether it be large or small). Even if you’re a startup company just getting your feet off the ground, you can capture the attention of Instagram users by being fun, witty and showing the progress your company is making. The technology and consulting corporation has over 200 posts and over 12,000 followers. They showcase their different offices around the world as well as company life including fun pictures of their employees. 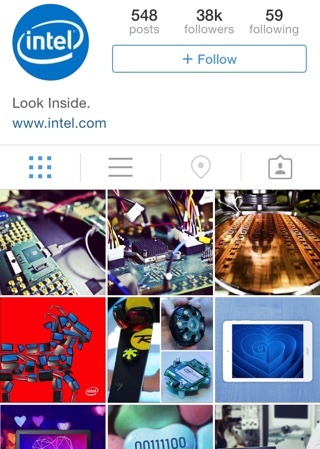 Once again a technology company, Intel provides designs and builds the components that serve as the foundation for the world’s computers. I know it doesn’t sound like they would have the sexiest Instagram account, but with 38,000 followers they’re clearly doing something right. They showcase photos of their designs at products at trade shows, how their products can be used in cool or unusual ways and even post photos of the engineers behind the technology. 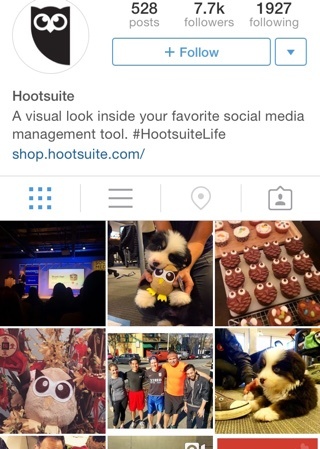 Hootsuite has grown their Instagram account to over 7,700 followers with over 500 posts of company culture, events they’ve attended or spoken at and countless photos of adorable office dogs (we’re very jealous). They know their audience and each photo they post directly speaks to what they enjoy and what they want to see from the fun startup lifestyle Hootsuite embodies. Moral of all this? Don’t count out Instagram even if your industry or business doesn't’ scream visuals. Discover who your audience is and post accordingly, showcasing who you are as a business and what your brand represents. The social world is a saturated space. But that doesn’t mean you can’t make your brand stand out. These are just a few of the ways you can uniquely brand your business on social and reach your audience in new ways. Are there any other new or unusual ways you have found success through social media? I would love to hear your thoughts and experiences below!